RadPivotGrid can apply different calculations on your data. Instead of presenting the whole Total number by using calculations you can show other information - for example what percentage of the GrandTotal is the value in particular cell. PercentDifferenceFrom - the logic behind this calculation is the same as DifferenceFrom, but instead the difference is calculated in percents. You can also set "Percent Difference From Next" or "Percent Difference From Previous" and this way the value in each cell will be the differences between its value and the value in next/previous cell, but calculated in percent. PercentOf - values in the cells are percents of a sample - for example percent of next/previous or percent of a particular group description. PercentOfGrandTotal - values in the cells are percent of the GrandTotal. PercentOfColumnTotal - values in the cells are percent of the ColumnTotal. PercentOfRowTotal - values in the cells are percent of the RowTotal. RunningTotalIn - the value in the cell is aggregation of the value in the previous cell and the total in the current one. Last item in the collection holds the GrandTotal values. For example in the image below the value which stands for "Pen" in promotion "Extra Discount" is a sum of its own total (32.67) and the value of "Notebook" in promotion "Extra Discount" (69.10). PercentRunningTotalsIn - the value in each cell is accumulated from the total in it and the value in the previous cell. The result is presented as percent of the GrandTotal. GrandTotal is present in the last item in the collection with the value 100 percents. RankTotals - the value in the cell is integer representing the rank of the current total in the current collection of totals. You can set ranking to be from smallest to largest or from largest to smallest. You can change the applied calculation at runtime by using RadPivotFieldList. If you want to apply calculation at design time you should use TotalFormat property on PropertyAggregateDescription. Axis - this property defines if the calculation should be applied on the rows or on the columns. Level - this property sets on which group description to apply the calculation - for example if you have three RowGroupDescriptions first one has level 0, second one - level 1 and the third one - level 2. GroupName - this is the exact name of the group based on which the calculation will be applied. Note that this is a particular header in the rows or columns. For the above example we have defined "Name" as PropertyGroupDescription in RowGroupDescriptions collection. 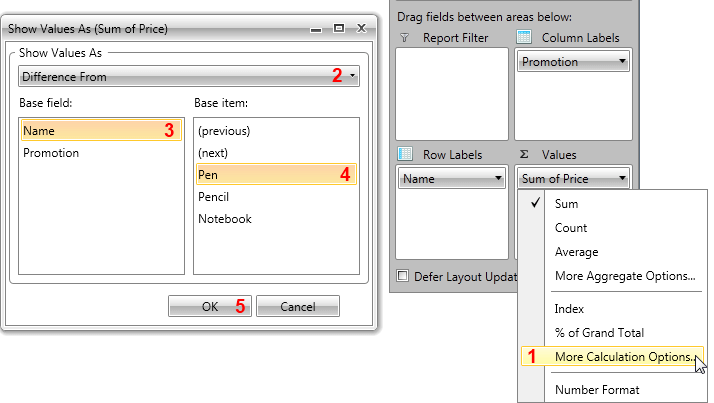 But the GroupName that has to be set when the Axis is Rows is one of the RowHeaders: "Pen", "Pencil" or "Notebook". When you want to apply/change the calculation at runtime you should use RadPivotFieldList. Just click on the aggregate description and choose one of the defined calculations or select "More calculation options..." option. This will open a new RadWindow where you will find all predefined calculations and you will be able to set them with just a few clicks.